Alyson Hannigan, the How I Met Your Mother actress, recently wore the Ergobaby for Petunia Pickle Bottom Organic Baby Carrier – Frolicking in Fez. Offered in a variety of beautiful styles, this esteemed collaboration arrived last spring. 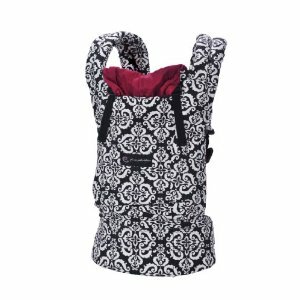 The Ergobaby for Petunia Pickle Bottom Organic Baby Carrier – Frolicking in Fez ($145 at Amazon.com) pairs the comfort, versatility, and convenience of ergobaby carriers with the sophisticated black print with red accent from Petunia Pickle Bottom®. The carrier has a 100% organic cotton body and lining and is GOTS certified. Like all of their carriers, the padded shoulder straps and waist belt comfortably distribute baby’s weight between your shoulders and hips. The carrier holds and cradles your baby just the way you do, with your baby’s legs properly supported in a natural sitting position.